Staring into the crater of an active volcano and watching the boiling lava churn and crash against the rock is at once an exciting and humbling experience. 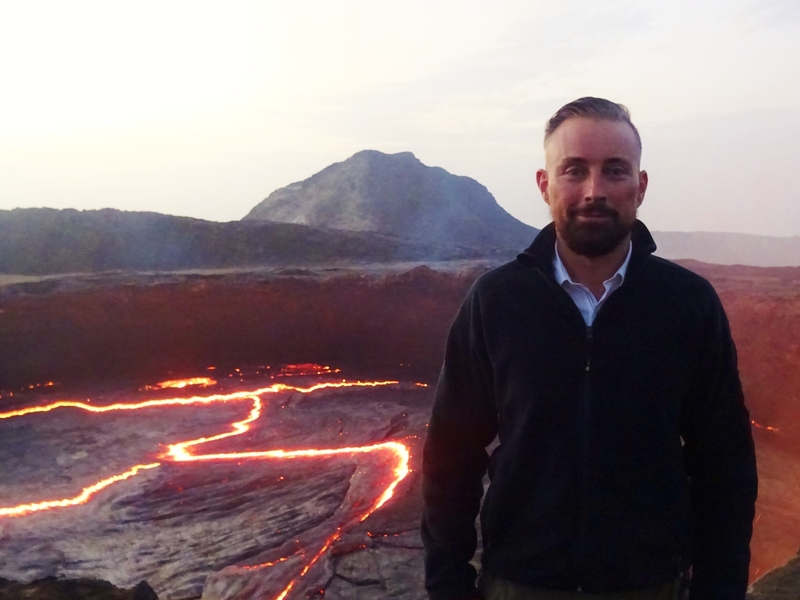 At Erta Ale, a volcano in northern Ethiopia, you can do just that. It’s located in the country’s Afar region, not far from the border with Eritrea. It’s one of only six volcanoes in the world with a lava lake in its crater. Erta Ale is a shield volcano and just 613m high. It was created by flows of very liquid lava and, as its name suggests, it’s shaped like a shield laid on the ground. It doesn’t look like the movie-set triangular volcanoes one sees in films about dinosaurs, although from a distance you can just make out a wisp of smoke drifting into the African sky. Indeed, Erta Ale means ‘smoking mountain’ in Afar, the local language. Its lava lake has been bubbling away since early last century, longer than any other lava lake currently in existence. Erta Ale isn’t an easy place to get to. It’s set in the rocky, or badlands, desert of the Afar Depression near the border with Eritrea. Click on the movie to watch! To get there, you have to drive along what has been called the ‘worst road in the world’. In fact, even describing it as a road is rather generous: it’s more a winding, undulating track over a vast field of dried lava. It took us a couple of hours rattling around in a 4×4 to do just 10km. Lying so close to the border with Eritrea, the area around Erta Ale has had some security problems. Also, the local Afar people have a reputation for being hostile to outsiders. We encountered no such hostility, but after armed rebels killed five tourists in 2012 the authorities now insist on visitors being accompanied by soldiers. At the floor of the volcano is a base camp for those intending to make the ascent. It’s too hot to walk up during the day, so we waited for nightfall before setting off. I enjoy riding camels, so hired one to add to the experience. But the saddle was the most uncomfortable I’d ever sat on and after an hour or so of agony I dismounted and walked the rest of the way. As we got nearer, we could see an orange glow in the night sky. Once at the summit, we made our way to the crater. On the way up I’d been thinking about what a lava lake would actually look like. I’d seen photos, but nothing can quite prepare you for standing on the edge of a crater and looking down into a bottomless pit of bubbling lava. Below us was a constantly moving mass of molten rock. Rivers of bright orange lava flowed between shields of black. It reminded me of aerial views of cities at night with the lights of thousands of cars on packed roads below. But in the dark it was difficult to get any sense of scale. Every now and then the cooler, black rock would burst upwards with a low roar into a fiery bubble, releasing pressure that had been building up. Seconds later, it would collapse back in on itself and melt back into the boiling mass. The lava seemed to be slowly flowing across the crater. At the far end, waves of molten rock crashed against the sides like a stormy sea breaching on a cliff. Watching the lava was like gazing into a fire: endlessly fascinating, but on a scale beyond comparison. Above us, rising up into the night air, were myriads of what looked like tiny sparks. In fact, it was Pele’s hair. Named after Pele, the Hawaiian goddess of volcanoes, these are thin strands of volcanic glass fibre thrown out from a volcano. We spotted some on the ground, but it was only when dawn arrived that we saw that these brittle fibres covered much of the rock around the crater like a carpet of grey grass. It was a fantastic experience to stand on the edge of the crater of an active volcano and to witness the immense power of nature. On occasion, I did wonder ‘what if it really erupts’, but realised there was only one answer to that question and it wasn’t one to dwell on!